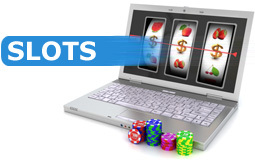 Online slots based on lucky items like 4 leafed clovers, luck of the Irish and lucky Zodiac signs. Play slots such as Irish Luck Slot, Lucky Stars Slot, Best of Luck Slot from Rival Gaming, Emerald Isle Slot and the new microgaming slot Irish Eyes. 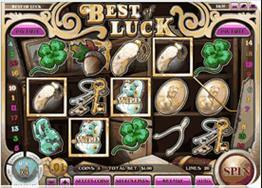 The Irish Luck slot machine from playtech is full of lucky symbols. Simply spin up some golden horseshoes, pots of gold, or four-leaf clovers. This fun filled slot features a Gold Pots bonus round where you can win 8 free spins and double all of your winnings. The bonus round also lets you choose an additional 2 gold pots which are full of more free games and extra multipliers – this gives you the chance to triple or quadruple your winnings! Overall, you can win up to 33 free spins and up to a 15X multiplier in the Gold Pots bonus game. Best of Luck is a 5 reel, 20 line Rival gaming slot that offers not just 1 bonus game during free spins, but 6 bonus games! if you get 3 of the same bonus rounds in a row, you will also be given an additional 3 free spins. This slot certainly keeps you entertained and you won't get bored playing Best of Luck Slot! 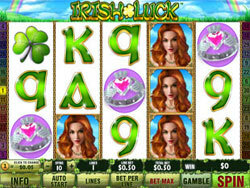 The wearing of the Green and the Luck of the Irish will tempt you to play this entertaining slot. The secret to some good wins is the wild and scatter symbols. The Leprechaun is the wild symbol and he can substitute other icon. Get him on line 1 and line 5 at the same time and you are in for a great bonus round. At the end of the Rainbow there is a different pot of gold - trigger between 2 to 5 at any time and you can multiply your bet up to 100 x, depending on how many you reveal The Emerald Isle Slot will bring out the Irish in all of us – a great game! Lucky Stars Slot is a microgaming slot with 5 reels and 20 paylines. The game has wild symbols, scatters, and a "Lucky Stars" feature that lets you decide whether to choose 15 free spins or play a bonus game. 3 or more magic Sodiac wheels will give you 7 free spins and all wins are at 4x multiplier. Enter the bonus level by choosing a star sign from the 12 mystical symbols on the Zodiac Wheel. If the wheel lands on your chosen sign - you get to choose either free spins or a bonus game. If it doesn't land on your chosen star sign you will still win a consolation prize of 10x your bet. 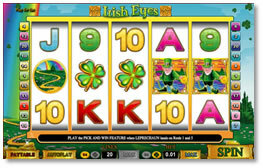 Irish Eyes is a 25 line 5 reel Video Slot from microgaming with an Irish Luck theme. The game has a popular theme full of eye catching graphics and sounds to create that magical Celtic experience. Look out for two fantastic features that offer pots and pots of prizes!